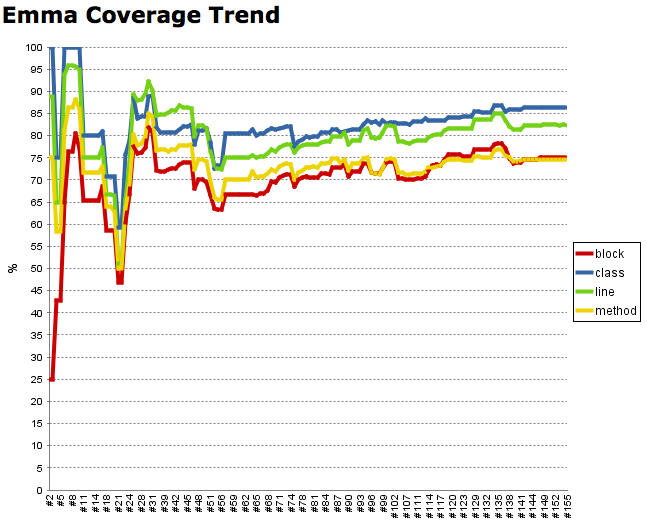 In my last blog post I gave details of how I user the modified code coverage viewer for flex in an automated build to follow the trend of code coverage over time. The trouble with this approach was that there was a problem either with the localConnection in flex or the code that uses it and there was a wide variance of the values being reported. This post shows you how I fixed it by creating a headless code coverage reporter that you can drop into your test harness and remove the need for a second application altogether. Note that if you don’t specify the metadata path and at least one of the report formats, the headless agent will log errors but otherwise fail silently. In terms of the edits I made to get it working, that is pretty much it. The headlessCoverageAgent swc is probably larger than it needs to be and is definitely grossly inefficient. I will update this soon to improve this, but right now I only have time to get this post up. Obviously you will have to change your build script to pass these new commandline parameters in to the test harness when you run it. If there is any interest, I’ll post my updated build script and test harness modifications that dispense with the log parser altogether and make for a more repeatable build script. My build process is now much quicker because I don’t have to wait to be sure that the coverage viewer has initialized. It’s also completely stable and the code coverage trend has been a great motivator for the team. I am trying use your headlessCoverageAgent in our build system on a flex4 project. I get the following error when I try to compile test application. I suspect it because your swc was compiled with flex 3.2 or flex 3.4.2. Is there any chance that I could get hold of the source or have you compile me a flex4 swc? to produce a cvm and run the coverageviewer to see results. In that respect, I believe the coverage mod is working. Now, I would like to integrate this into my hudson build. Could you please post the source or share with me a flex4 flavored swc? Not sure if my previous message made it to you but I have the flex4 working with flexcover using the coverageviewer. All i need now is a flex4 flavored swc of headlessCoverageAgent. “VerifyError: Error #1014: Class flash.events::InvokeEvent could not be found. When I try to use this headlessCoverageAgent.swc within my Flex project I get errors that AIR classes like File or InvokeEvent are missing. Am I doing something wrong or can it only be used in AIR projects? This is awesome! Thank you for taking the time to post this! I am trying to get this working and am running into some difficulties. First I should mention that I am using Flex 4 via the port now available on the FlexCover site: http://code.google.com/p/flexcover/issues/detail?id=35 – Using this I am able to get coverage results by using the standard coverage agent. When I run with the command line parameters, I am getting cvr and emma files that are reporting zero coverage. After this, it looks like it’s transmitting data to the viewer, but the viewer numbers never change. It says it receiving new elements and updates happen, but the coverage numbers never change. The constant trace messages that come up when running without command line parameters do not happen when running with the command line parameters. off the top of my head, I’m not sure what’s going on here. I’m pretty much heads down at the moment, but I’ll fire you over a copy of the source code and you can have a shot at stepping through the code. Quick update on this: Brian managed to get the headless coverage agent working perfectly by simply recompiling using the Flex 4 SDK he had (4.0.0.10118). For now I won’t post a new headless agent as the plan is to incorporate the code into FlexCover in due course. If anyone has a desperate need to use the headless agent in a stable Flex 4 environment, let me know and I’ll work out a way to get the code to you so you can build a swc for your SDK. I’m reading this article and I’m really inetrested in getting this working on Flex4, I’d like to integrate flexcover in our CI (hudson). Could you, please, send me the source to compile in flex 4? Thanks in advance for your great job! Hello – Thanks for the great work here. I’m trying to incorporate the headlessAgent into Fluint’s AirTestRunner. I’ve modified the AirTestRunner.mxml, adding a preinitialize which injects CoverageManager.agent = new CoverageAgentSwitch(); and have added parameters to the launch as appropriate. It looks like the headless agent is being created in lieu of LocalConnectionCoverageAgent, and Fluint manages to dump it’s output when the application exits, but I am not seeing any of the generated reports from the headless agent, either in the original format, or in emma format. For those who might be interested, getting this running with Fluint was pretty painless, but a matter of cobbling bits of info from various places. Here’s an AIRTestRunner.mxml you can drop into a pull of the fluint code; export a release build with these changes, and your airtestrunner will be “headless enabled”. Details available at the above link. Posting this as a track-back. Great Post! I am using the flexunit task but cannot get the command line parameters to be passed in properly. Can you post your modified build script? Or point me in the right direction? Hi, I want to use the flexcover so that if i put teh instrumented swf on a central server so that many users can use it and code coverage will increase accordingly.?? Can i do so ?? Is there any way that the instrumented swf is being used by many users?? The download links for the emma reporting patch and the headless coverage agent swc seem busted. I was able to pull the emma patch out of google’s cache, but no such luck for the coverage agent swc. BTW- do you have source code for that? Any progress on sharing the source code for headless coverage agent swc?